Visiting the planet locations in this scale model is only the beginning! There are a variety of activities to be had, from camping, hiking, picnicking, and the usual outdoor stuff. 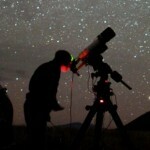 Stay overnight, and bring your telescope – Grouse Ridge is an excellent observing spot! Make it an adventure, in the Geocaching spirit! Plan ahead, and make your own planets! Below are some tips, tricks, and a few links to get you started. Please feel free to share your own experiences, as well! If you only visit one planet, visit Earth! The Geocache of Earth, like all in this series, has an object in the container which represents the scale size of the planet. This particular case is unique: Earth has its moon tethered to it. The dimensions are a bit of a surprise to most people. When visualizing the distance between Earth and Moon, folks tend to think of the moon as much closer than is actually is. For a really good time, try this: Have someone hold up the moon at the end of its 4 feet of string, while you hold Earth next to your head. If you move around a bit, you will find that the Moon is similar in size to the lookout building nearly 1,500 feet away. Very similar in size. Why is this? Well, the proportions of Sun and Moon in the Solar Model and that of the actual Sun and Moon are the same. It would make sense, then, that the scale objects, like the real ones, are both almost exactly 0.5 degrees of arc in your field of view. In fact, if you move around a bit and get the moon in the right spot, you can “eclipse” the Lookout – it will cover the building almost perfectly!